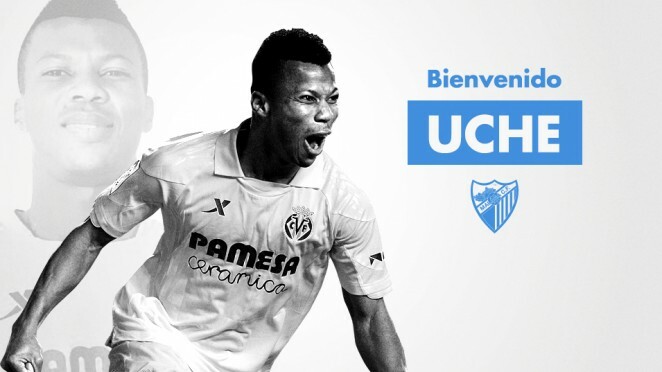 Nigerian striker, Ikechukwu Uche, from Mexico’s Tigres UANL, is on loan to Málaga CF until 30th June. The African player, with a Spanish community passport, becomes Málaga Club de Fútbol’s fifth signing during this transfer window, along with Chory Castro, Christian Atsu, Cifu and Ricca. Speed, power, good movement with the ball, goals and extensive professional experience. He can play as a striker, second striker or on the right wing. Between 2002 and 2015 he was part of various Spanish teams in the First and Second Divisions, and scored a hundred goals before leaving for Tigres in Mexico. Racing de Ferrol, Recreativo de Huelva, Getafe CF, Real Zaragoza, Granada CF and Villarreal CF were the clubs he was with in Spain, achieving promotion and named ‘Pichichi’ (20 goals) with the Huelva-based side. This wasn’t his only promotion, as with 14 goals in 2012/13, he contributed to Villarreal’s return to the elite. An international with Nigeria for nine years, he was proclaimed champion, along with his country, of the Africa Cup of Nations held in South Africa in 2013. Height: 1’ 78 m. | Weight: 70 kg.